Today I am sharing a few favorite autumn picture books with you guys. Some of these are new to us and some are favorites from previous years. Thanks for tuning in this week. Hopefully you found a few “new to you” books to add to your collection this fall season. I love chatting with you all live and sharing some of our favorite books each week. So tell me… What books do you enjoy this time of year? Today I am taking part in the weekly challenge from Homeschool Scopes and chatting about extra-curricular activities and how we make them work for our family. So tell me… What activities do your children participate in and what creative ways have you made this work for your family? 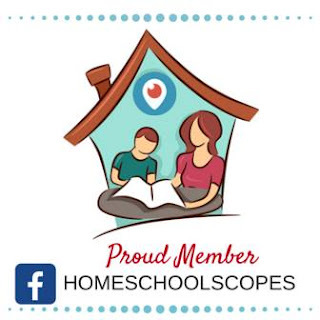 Homeschool Scopes is an amazing online group that connects homeschoolers via live broadcast. You can connect daily with other moms as well as watch the fun "Homeschool Happy Hour" hosted by one of the members every Monday - Friday at 3:45pm Central. Please hop on over to HomeschoolScopes.tv to join the fun! If you still have little ones in your home, then you know that this quote is so, so true. Those little guys are just like sponges and they are soaking in so much each and every day. My encouragement to you today is not to forget that even your older children are still learning all the time. They are watching you and learning your habits and they are still absorbing so much knowledge through the daily living and interaction right in your home. If you are like me, this can be a very scary thought until we remember that these children are really gifts from the Lord and they are on loan from Him. No matter how much we think we are messing up each day, we can fully rely on God to see these precious blessings grow to glorify Him. As we are wrapping up our 1st term this school year, you may be feeling like me… A tad bit overwhelmed, burned out, or just generally ill-equipped to balance this whole parenting + homeschooling + the rest of regular life stuff. If you can relate then I encourage you to join me for the Homeschool Teaching Summit. It will refresh your excitement for this homeschool journey we are on, equip you with practical teaching tools, and transform your vision for Christian education and discipleship. I am so excited to learn from these speakers and prepare myself for the rest of this school year as I lead my children in Christ-like teaching. Want to know the BEST part? It is all online and it is FREE so you can snuggle up in your pajamas + grab a cup of yummy tea and never have to fight those vendor hall crowds. Ha!! Most importantly, each video from this event will focus on the truth found in God’s Word and the hope that lies in trusting in Jesus Christ for today and for the future. I encourage you to sign up today for the Homeschool Teaching Summit so you can join me in being refreshed, equipped, and transformed on the journey toward teaching our children for God’s glory! Happy Tuesday! Today I am sharing a few family favorites that we have been enjoying lately. It is a wide variety of titles today so hang on… Pilgrims + Living Math + Volcanoes. Oh My!! Thanks for tuning in for this week’s Take A Look Tuesday episode. I love chatting with you all live. So tell me… What books are your family enjoying this month? Do you have some favorite easy chapter book recommendations for my beginner reader?